If you are on the hunt for a new thrilling and suspenceful horror flick, then IFC Midnight’s latest release, Rites Of Spring, is the one for you. Written and directed by Padraig Reynolds, Rites Of Spring brings the thriller and horror genres together in perfect harmony. This film delivers on all cylinders with an exciting story line, a believable cast and tons-o-gore. While two stories are being intercut during this film, one being more of a thriller and the other a straight-up horror piece, Rites Of Spring delivers a perfect marrige between the two. With a creepy old farmer preying on young women in one, and a kidnapping that doesn’t go as planned in the parallel tale, a great deal of mystery plays out in both. The cast found within this film are all lesser known/unknown actors who obviously have a passion for film. Anessa Ramsey delivers a spine-tingling performance as the character Rachel and after this film, she is destined to be called upon for many more horror roles in the future. From her line delivery to her trembling hands, Ramsey’s screen presence is remarkable to say the least. As the film progresses, the blood begins to spill more and more. There are a few effects, that looked to be done with After Effects, that can be done without, but overall the look and realism of the gore is well above average. A round of applause must be give to the practical effects crew as well as the members of this production who came up with the look of the mysterious monster-like killer. This very scary and realistc looking crazy killer dons old rags and maggots as he brutally murders his victims. 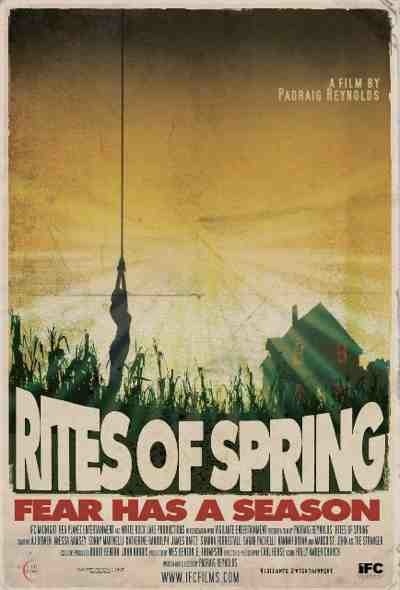 Rites Of Spring was a surprisingly fun and blood filled ride from begining to end.